The Steyr L9 and M9 aren’t picky about ammo, and they have nearly Glock-like reliability in dust and dirt. They have superb factory triggers and softer recoil than almost any other polymer-framed striker gun. Spare magazines are expensive ($35+), and the same goes for replacement sights, although the factory trapezoidal sights are some of the best available for close-quarters duty. Sadly, the grips are completely non-adjustable, but you can get the M9-A1 in OD green, so that’s something. Threaded barrels are readily available but pricey ($250), barrel lengths range from 4.5” to 3.6” with frames in both full-size and sub-compact. Prices range from the low $400s to the low $500s, a semi-premium price point that can stack unfavorably with the pistols’ unfamiliar silhouette and poor name recognition in the USA. Because of this, Steyr pistols are often overlooked, but that’s a mistake – a great trigger, soft recoil, and superb reliability are all you can ask for in a pistol. Just don’t expect to see them on sale too often. Steyr USA is currently an advertising partner with GunTweaks.com. This means that we like them and their gear - nothing more. 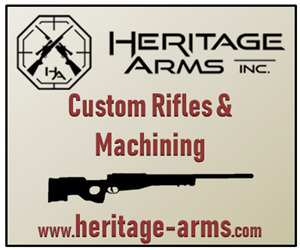 GunTweaks is self-funded with most of our ad partners providing us equipment to review, but when we do receive cash ad revenue, 100% of it goes right back into the site to offset our web hosting fees, shipping/transfer fees, etc. This ensures we stay independent so that you, the reader, can trust our reviews. The Steyr M is one of the more established poly-frame strikers on the market, rubbing shoulders with the S&W M&P and Springfield XD/HS2000 with all three initially hitting the market around Y2K (+/- a few years) in response to the success of the Glock. 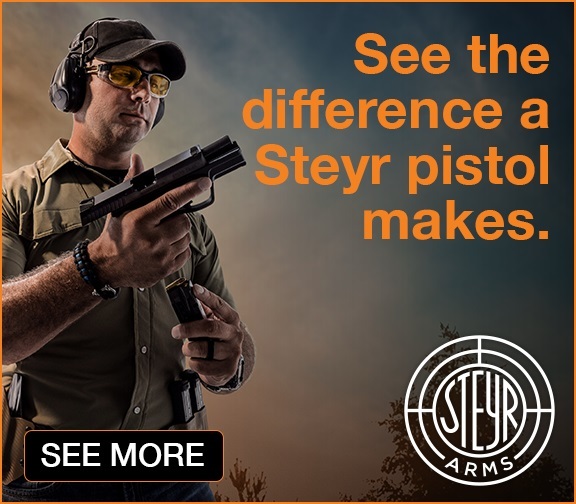 Also like the S&W, Springfield, and Glock, the Steyr has undergone steady updates and improvements since then - an under-barrel rail, several loaded-chamber indicators (LCI), an improved trigger, an improved extractor, etc. The Steyr M began as one pistol back in 1999 but it’s now expanded into the L, M, C, and S sub-models, all based off the action of the original Steyr M and all currently available in 9mm and .40 S&W in the USA. We called up Steyr to ask if they would send us one for review and testing, and a few days later we got the call from our local FFL, Tri-State Outfitters (TFO). TFO a great shop for hunting, hiking, fishing, or really anything outdoorsy in southern Washington and Idaho, and best of all, they actually stock cool guns in addition to the requisite rows of hunting rifles and clay shotguns. ​Starting at the big end, there is the Steyr L-A1 - a full-size grip mated to a 4.5" barrel, with two Picatinny slots under the barrel and forward slide serrations. Steyr sent us a L9-A1 with a set of TruGlo TFX Pro sights - rock-solid, factory-installed sights that combine fiber optics with tritium inserts. Any potential buyer worried about Steyr's unique trapezoidal sights (they shouldn't be, trap sights are great) can keep calm - the TruGlo TFX sights are a standard three-dot arrangement, and Trijicon and XS Sights also make sights for the Steyrs. Next down the line is the Steyr M-A1. This is the same full-size grip as the L-A1, but the front slide serrations disappear, and the Picatinny rail is shortened down to one slot and seated under a 4.0" barrel - similar proportions to a Glock G19X. The M-A1 is the cornerstone of the Steyr pistol lineup, and is the only Steyr pistol available with a OD green frame as well as classic black. Steyr supplied us with an OD green M9-A1 wrapped around one of Steyr's threaded, hammer-forged barrels - available from Steyr in multiple thread pitches for the M and L barrels, in case you want to make your shots a bit quieter. One more step down the line is the C-A1 - again, a full-size grip, but this time matched to a 3.6" barrel. This combo of subcompact barrel and full-size grip is a very unusual option in the handgun market, and could make for an exceptionally quick-handling but steady-shooting pistol, although the full-size grip would be a drawback for concealment. We initially thought the oddball C-A1 was simply two existing grips and slides slapped together and called a new gun, but not so. Steyr slides do not have extended dust covers, so swapping a longer slide onto a shorter frame yields an unsightly and debris-prone gap. 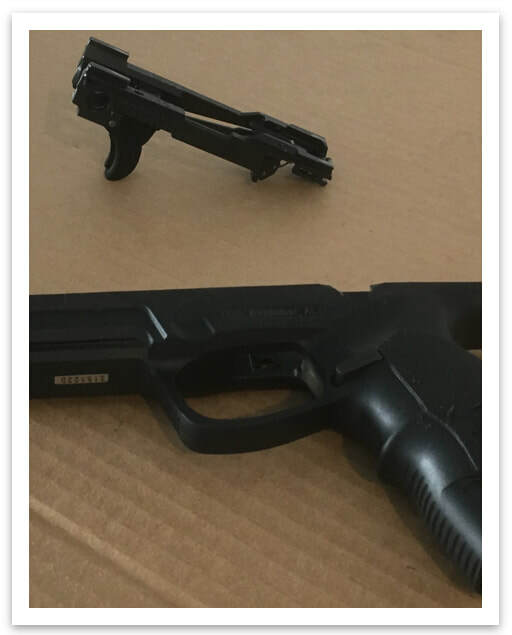 Gun families that intend for different lengths of slide and frame to be swapped, like the Sig P320, get around this problem by using an extended dust cover under the slide. 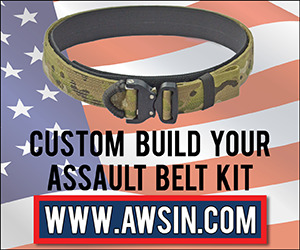 All this means that the C-A1's frame (and by extension, the L-A1 and M-A1 frames) is a custom part matched to that specific model's barrel length. An interesting choice by Steyr. Finally, the S-A1 is a very competent subcompact with a 10 round magazine wrapped in a diminutive grip, and mated to the C-A1's 3.6" barrel. All Steyrs come with two magazines and two gun locking keys inside a competently-made plastic case. The first thing you'll notice about a Steyr is its unusual silhouette. Much of that aesthetic comes from the gun's startlingly low bore axis and unusually steep grip angle - both characteristics that stem from the Steyr's uncompromising commitment to low muzzle flip. Our Bore Axis Comparison article shows the Steyrs have the lowest bore axis of any tilting-barrel pistol we have measured, putting it at the lowest bore axis of all full-size pistols (at least, until we get our hands on the vz-15, Stryk-B, or Caracal Enhanced F. Anybody want to help us out?). The lower the bore axis, the less leverage the gun has to kick upward, and the less muzzle flip you will see with each shot. The steepest grip angles are still held by single-stack .22LRs like the Beretta Neos, and by older (but still single-stack) service pistols like the Luger P08 and Papa Nambu, but the Steyrs aren’t far behind. The steeper the grip angle, the less leverage the gun has to kick upward, and the less muzzle flip you will see with each shot, but the geometry of magazine feeding also becomes more challenging - the Steyr M clocks in at around 65 degrees, which is probably about the practical limit for a reliable, double-stack, centerfire magazine. Front slide serrations are only available on the L9, so for those of you who obsessively press check, you better love a long barrel. The trigger guard is slanted so it won’t catch on clothing or gear, but serrated for those that like a finger-over-triggerguard grip. Steyr is not immune to the economics of manufacture – a metal injection-molded (MIM) extractor was hiding deep within its guts. That’s the only MIM part we found, and to be frank, we don’t really care. MIM parts are just fine, and when you really start tearing guns apart, you’ll find plenty of them even in the premium brands like Steyr. This is the new model extractor, with a ledge to act as a loaded chamber indicator (right) and beveled extractor detent (left). Like most other polymer-frame strikers, the L9 weighs in at around 1.5 lb unloaded - 24.4 oz, to be exact. The M9 weights fractionally less. Let's pop the hood on this thing. Inside, the Steyr is an unsurprising tilting-barrel action that locks to the ejection port - standard fare since the 1980s for good reason. All Steyr barrels are hammer-forged, and this one uses conventional rifling. The recoil spring is made from flatwire, not standard round spring stock, which is a nice touch. Said recoil spring hugs a full-length, plastic guide rod. Steyr’s recoil springs are tuned right down to the bare minimum – if you point the gun upward so gravity is pulling on the slide, then rack and hold the slide, riding it forward as slowly as possible, the slide will only go about 95% into battery. It will click to 100% once you point the gun level, as it would be in normal firing, but the spring is right on the edge of not being stiff enough. This is a rare quirk, and compounded by the Steyr's single action only (SAO) striker assembly - on the closing stroke, the recoil spring is responsible for cocking the striker as well as stripping a round from the magazine and achieving full battery. ​Speaking of the Steyr's striker assembly, it's rare to find sear engagement surfaces that are as dramatically angled as these. Combined with the SAO lockwork, the Steyr gets a very light, very crisp trigger. ​​This weak return to battery didn’t hamper the Steyr’s reliability as long as the recoil spring wasn’t worn out (more on that in the Bullet Salad and Dirt Test sections) but it’s an interesting engineering choice, possibly intended to keep the Steyr’s minimalist slide as easy to rack as possible. If you’d like to play with recoil springs, a Glock 9mm’s recoil spring and guide rod are a hairs breadth from fitting, so rustle up an uncaptured Gen 3 Glock guide rod and some springs for the appropriate barrel length. The Glock spring will fit in the Steyr’s guide rod channel, but the guide rod will require some sanding. The above is a Gen 4 Glock 17’s recoil assembly, shown only to illustrate the similarities in fit to a L9-A1. ​Opt for an uncaptured, Gen 3 guiderod and springs and expect to do some hand-fitting. Speaking of the slide, racking is easier than the fingertip-pinch on a CZ-75 but not as straightforward as most other guns. It’s still a gross motor skills movement, pretty hard to muck up, and we only mention it because it did take some practice to nail a consistently positive grip when drawn from Condition 3, aka Israeli method, aka racking the slide as you draw and bring to aim. If you do carry Condition 3, rest assured the Steyr will still work fine – just spent some time practicing. It’s still easier than a CZ. So why the slim slide in the first place? It comes from Steyr’s combo of low bore axis and extensive slide beveling, which together offer up an impressively low reciprocating mass (slide + barrel): 15.4 oz for the L9, whereas a Glock 17 (same barrel length) clocks in at 16.8 oz. That may only be 1.4 oz, but when it’s moving at umpteen miles an hour as the slide shoots backward, reciprocating mass matters a lot to felt recoil – competition shooters aren’t paying hundreds for lightening cuts in their slides just for grins (well, okay… some of them are). Like the steep grip angle, the low bore axis and lightweight slide are all part of the Steyr’s commitment to lowering felt recoil. The bevels on the Steyr slide (right) reduce weight, but sacrifice a small amount of grip. Additionally, the Steyr’s slide isn’t quite as tall as the Glock’s (left) so there is less real estate to grab to begin with. Moving on, the Steyrs pack three different loaded chamber indicators – a chamber viewport, an extractor that protrudes when loaded, and a pin in the rear of the slide that protrudes when loaded. The M9-A1 we received didn’t have this third pin LCI, although the L9-A1 did, so that’s something to look for when buying used. The Steyrs bring a firing pin safety and a drop safety to the table, as well as a Glock-style trigger blade safety to prevent off-axis trigger pulls. Various overseas models have been offered with a manual safety as well, but these will only be encountered sporadically on the used market. The trigger group can be removed from the frame completely for detailed cleaning. 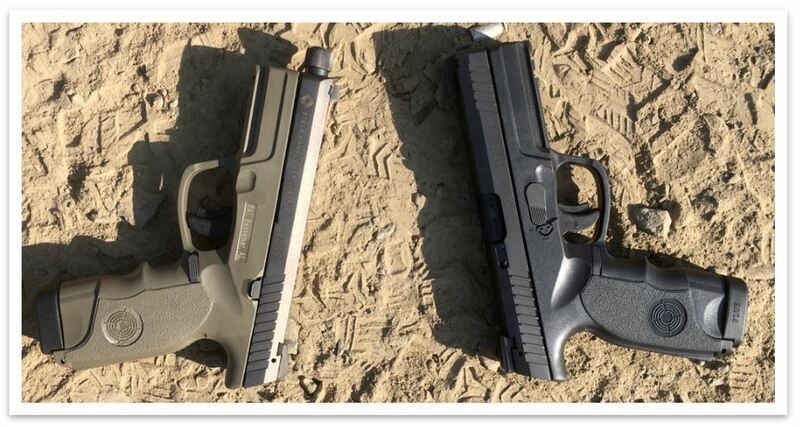 If you think this trigger housing looks suspiciously similar to the Sig Pauer P320’s, well, Steyr agrees with you - Steyr sued Sig Sauer for patent infringement. We don’t know the details of the lawsuit, whether it is ongoing or finalized. One big difference between the two guns is that the Steyr’s frame is still the serialized portion of the gun, whereas Sig serialized the trigger group. So, no swappable grip modules for the Steyr (unlike the P320). Although not often seen in competitions due to their niche market status, there is nothing barring the Steyrs from competing in factory-class competitions like IDPA SSP. Their weight and size are fairly standard for polymer-frame strikers, and their low recoil can be a competitive edge. For this application, consider replacing the trap sights. No external safeties are present, although as we mentioned, you may encounter a Steyr with a manual safety on the used market. The trigger has a middle blade safety, like a Glock, but the Steyr’s blade safety is huge by comparison. The trigger blade’s wide, flat face that feels much more like a normal trigger. The return spring behind the trigger blade is also very light, so it requires almost no pressure to press the trigger blade down. Both of these features combined mean the Steyr’s trigger blade doesn’t dig into your finger the way a Glock’s does over the course of a long day of shooting. However, the Steyr’s wider trigger blade will be less effective at guarding against off-axis trigger pulls by the edges of holsters or careless fingers. In theory, the most comfortable trigger blade safety would be as wide as the trigger itself, but then it wouldn’t guard against off-axis pulls at all because any pull on the trigger would also be a pull on the blade safety. So, pros and cons to both approaches, and like all trigger blade safeties, we found the Steyr’s to be vulnerable to dust and dirt - see the Dirt Test Results Discussion section. The trigger itself is very, very nice – 4.5 lb on the L9 and 5.25 lbs on the M9, both with a 0.15” (3.8 mm) reset. When torn apart, the two trigger packs looked like they had identical parts with identical markings, so it appears that a 0.75 lb variance in trigger pull from unit to unit is normal in Steyr pistols. 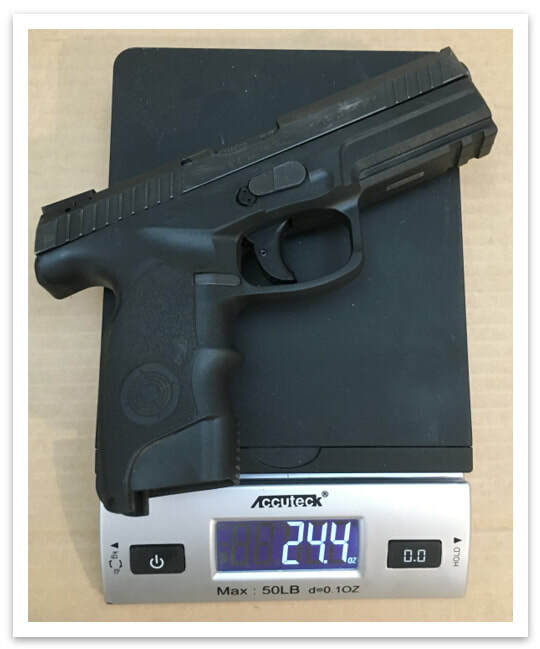 A Glock 17 Gen 4, for comparison, is at 8.0 lb and a 0.2” (5 mm) reset. Our only complaint with the Steyr trigger is that reset is very faint – it is both audible and tactile, but just barely. That said, since the reset is so incredibly short it’s very unlikely that you’ll wind up short-stroking this trigger. As striker-fired factory guns go, the Steyr's bang button is about as good as it gets. Other guns from premium brands can compete and maybe surpass on “feel”, but the Steyr’s pull weight, reset distance, and trigger blade comfort are top-shelf. Some say the trapezoidal (“trap”) sights on Steyrs are love them or hate them, but we think anyone who hates them needs to grow up. They are duty-driven sights meant for large targets at close-medium range, and for this application, we think they are some of the best, maybe the best, non-illuminated sights on the market. The biggest criticism of trap sights is that they are less accurate than traditional three-dot or post-and-notch sights, and this is fair – our groups with the trap sights on the M9 were consistently larger than the groups we posted with the L9’s Truglo TFX Pro sights. However, this is like saying that a red dot sight is worse than a scope because you’ll turn in better groups with a scope. It’s probably true, but that doesn’t mean red dots are bad, it just means they’re for a different application. The trap sight’s massive front triangle sticks out like a sore thumb - these sights are so fast to get on target when drawing from a holster or low ready. If you need center mass accuracy out to around 15 meters, then Steyr trap sights are the fastest game in town. On the flipside, the TruGlo TFX Pros on the L9 are an exceptional execution of the classic 3-dot design - daytime bright via fiber optics with an orange circle to distinguish the front dot, and night-time bright via tritium inserts. We like when three-dot setups make the front dot extra-distinctive, and overall the TFX Pros let us turn in some very nice groups. See the Live Fire Handling Observations section. Finally, we were not gentle with these guns during testing, and both types of sights shrugged it off without complaint. The TFX Pros were particularly impressive, as fiber optic sights are generally the most fragile of all gunsight designs due to their need for maximum exposure to light. Magazines hold 17 rounds – technically they’re 15 round mags, but full-size Steyr magazines have shipped with a +2 baseplate for years now. They feature mag catch cuts on both sides to let the Steyr's magazine release be swapped for left-handed shooters. The only nitpick with the Steyr magazines is that they are more difficult than most to reassemble after cleaning - expect the baseplate to go flying a few times until you get the hang of it. Magazines are not particularly cheap or easy to find - $35 is about the floor for them in 9mm, but you’ll more often see prices in the 40s. They’re also not something you can find at your local big box store, so you’ll have to order online and wait. One thing the Steyr hasn't received as an upgrade is an adjustable grip - no backstraps here. That said, the three GunTweaks staffers who handled it all found the grip to be comfortable and had zero complaints with the grip angle after a short adjustment period. However, there wasn't a huge amount of diversity present (all three were males in their 20s through their 40s). The grip has stripping for traction fore and aft, as well as modest, inoffensive finger grooves. Texturing on the sides was found to be more than adequate even when palms got sweaty. Steyr doesn’t waste any oxygen talking about their texturing, which we were grateful for - in general, we've found that most pistols have had satisfactory texturing since around the mid 2000s, and mildly resent it when manufacturers try to convince the shooting public they've made some grip texturing breakthrough. There's a groove for the finger to rest in when off the trigger, which we like. This groove also houses the takedown lever, which is only worth mentioning because the takedown lever is made of steel. Steel conducts heat very well, and as the sun climbed high alongside the round count, that takedown lever started to get pretty toasty. It wasn't painful, but a few times, it was distracting. The slide release is handily placed but not ambidextrous. There aren’t any other controls to speak of – like many modern strikers, the control interface is pleasantly uncomplicated. There are no safeties or decockers cluttering anything up, and the slide release is a comfortable reach with the thumb. The magazine release is unusually shaped but effortlessly effective. The big question surrounding they Steyrs is simple: do they kick less than other polymer-frame 9mm pistols? The answer is similarly straightforward: yes. Even with its relatively weak action spring, the Steyr’s low bore axis, steep grip angle, and lightweight slide all stacked to provide a shooting experience that was noticeably less snappy than a Glock 17 we tested at the same time. We shot the Steyrs back-to-back with not just a Glock 17, but also a Tristar P-120 (an all-steel CZ clone), all three in 9mm. For what it’s worth, the steel-framed P-120 kicked the softest, followed by the Steyrs and then the Glock. All that said, the difference in snappiness between the Glock and the Steyrs wasn’t jaw-dropping – to give a completely un-scientific estimate, we’d say the Steyrs kicked somewhere around 10-15% less than the Glock. 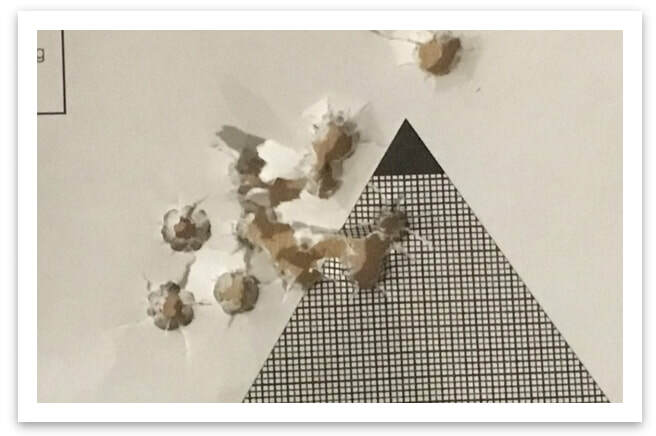 The drop in recoil was much more noticeable when moving to the P-120 – again, completely unscientific, but we’d estimate that reduction in recoil to be somewhere around 20-25%. However, it’s important to remember that the Glock is a runner-up to the Steyr for low bore axis and it is likely that most other polymer-frame 9s on the market will be faintly snappier than a Glock, and thus perhaps substantively snappier than the Steyrs. However, we only had the three pistols listed above so we couldn’t verify our hypothesis with back-to-back shooting of other popular 9mm pistols. There wasn’t an appreciable difference in kick between the Steyr L9 and the M9. The triggers were quite good, and we were able to get the holes to hug more often than not at 10 meters with the L9’s TFX Pro sights. Expect groups like these when casually plinking at 10 meters with the L9 and its TFX Pro sights - you can get most of the holes to touch. ​Grit your teeth and focus, and you can get rid of the flyers shown here. Target shown is the CHCOF Stage 1. The M9’s trap sights were less consistent, but as we mentioned before, they are sights optimized for speed over accuracy. If you need to draw from the holster and put two into center mass, at close range and as quickly as humanly possible, then the trap sights are the ones to beat. We also think it's very likely that groups with the trap sights will tighten up over time. The sighting system is so fundamentally different that it takes getting used to, and we only had a few hundred rounds to get the hang of them. Familiar practices like "equal height, equal light" are barely applicable, so we were unsurprised that our groups were poorer than we could obtain with the traditional 3-dot TFX Pros. The speed offered by the trap sights, however, was available from the get-go. will still hug occasionally, especially if you make an effort to do your part. Trap sights are optimized for speed over accuracy. Many have criticized the Steyrs for shooting low due to the steep grip angle, but we did not find this to be the case. The M9 did in fact shoot low, but the L9 did not, so this was actually a function of the trap sights and not the grip angle. The TFX Pros on the L9 shot right where we wanted them. All controls were uncomplicated and well-placed, so there was no re-training period to get used to the Steyrs. One more thing: the Steyrs both consistently released the slide when a loaded magazine was slammed home. Lightly loaded or slowly-inserted magazines did not get the same result, but loaded magazines tripped it every time. This behavior is seen occasionally in other guns, from Glocks to 1911s, but the Steyrs were startlingly consistent about it. Whether it's a bug or a feature, it makes for a pretty fast reload and its safety implications are minimal - we can't imagine a situation where we'd put a loaded mag into an open action and NOT want it to close immediately after. Oh, and magazines drop free energetically, loaded or not. We had enough 9mm on hand to feed the Steyrs what we call bullet salad - a quick way to learn a pistol's appetite. Skip to the results section if you’re familiar with the GunTweaks bullet salad concept. The L9 had a single failure-to-battery (FTB) on the Magtech Blue Line, but it was so slight that it went nearly unnoticed. As we would later find in the dirt test, the L9 had consistent FTB problems due to a bad recoil spring, and if we had replaced the spring before the bullet salad test, we doubt this FTB would have occurred. A quick push on the front of the slide (we got to use front slide serrations for something!) and we were off to the races without a single other hiccup, despite both pistols firing 7 different flavors of 9mm back-to-back. After the Steyrs both ate bullet salad happily (sans that single FTB hiccup on Magtech by the L9), we ran through several more boxes of mixed ammo types, to a total of somewhere around 300 rounds across both guns and still no malfunctions. A blend of slow-fire drills, holster-to-fire double taps, and other drills gave us a good feel for the pistols (see the Live Fire Handling Observations section), and with only a single FTB to spoil the fun, it was time to put the Steyr’s reliability to the real test. ​​Our “reference” gun (for handguns) is a Glock 17 Gen 4. When put through the dirt test, the Glock coughed up a single FTE after the first shot, then ran clear. It had no failures to battery or failures to feed. 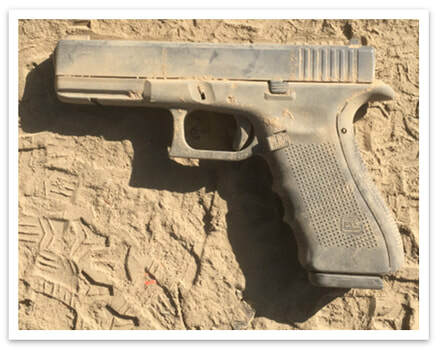 The Glock maintained a gritty, crunchy trigger pull until the gun was torn down in detail and cleaned (cleaning at the field strip level did not fully clear up the trigger). So far, that’s the best we’ve seen a handgun do. The M9 had one FTB and one FTE. The L9 choked repeatedly and continued to jam every few rounds for four magazines, at which point we retired it from the first round of testing. Concerned by this difference in performance, we detail-stripped and cleaned both guns, then swapped extractors between the two guns at Steyr's recommendation and repeated the test. The M9 again turned in one FTB and one FTE, while the L9 continued to choke. We then noticed that although both guns were equally dirty, the L9's return to battery was much weaker. Dry-racking both pistols in the shop, the M9 had no problem returning to battery, but the L9 would only fully battery part of the time. We decided the L9 must have a bad recoil spring. We detail stripped and cleaned (again) and obtained a replacement spring before repeating the test a third time time. On this try, the L9 turned in two FTBs and one FTE - still behind the M9, but only just. ​Shot 5 and onward were fired normally and the M9 ran fine the rest of the day. FTB, FTF, or FTE every 3-4 shots for two magazines. FTB, FTF, or FTE every 9-10 shots for the next two magazines. The L9 was retired from testing after four magazines. ​Shot 3 and onward were fired normally and the M9 ran fine the rest of the day. Similar results to L9 Test #1 - pistol was retired from testing after two magazines. Shot 4 and onward were fired normally and the L9 ran fine the rest of the day. The M9 was not tested a third time. The M9 was absolutely as reliable as a service pistol should be. 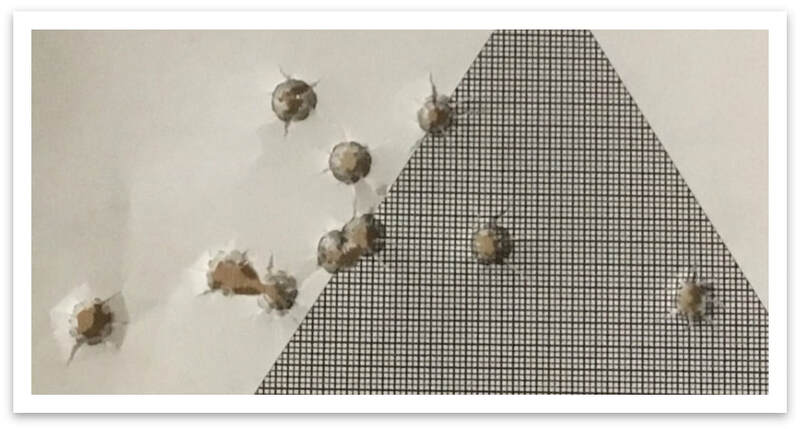 A Glock 17 Gen 4 put through the same test did not FTB, but it also coughed up a single FTE before shooting clear, so the M9 is nipping at the heels of the most reliable handgun we have put through the dirt test. The L9 needed a replacement recoil spring in order to shoot clear, but once the spring was factory fresh it was also very close behind the Glock. So, can the Steyr M9 and L9 be relied on when exposed to the worst of the great outdoors? We say yes. Although they FTB’d when the Glock did not, they went toe-to-toe with the Glock for FTEs. Additionally, the Steyrs shoot a bit softer and have better triggers than the Glock. The question is: are the Steyrs reliable enough? Ultimately, that's for you to decide - we're just here to give you the data. The Steyrs required complete tear-downs to bring them back to 100%. 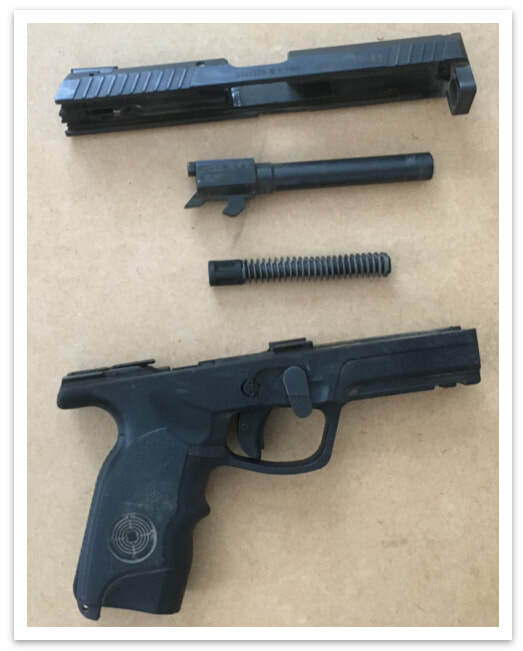 The trigger blade was particularly vulnerable and would not consistently reset forward until the trigger had been completely torn apart and cleaned. 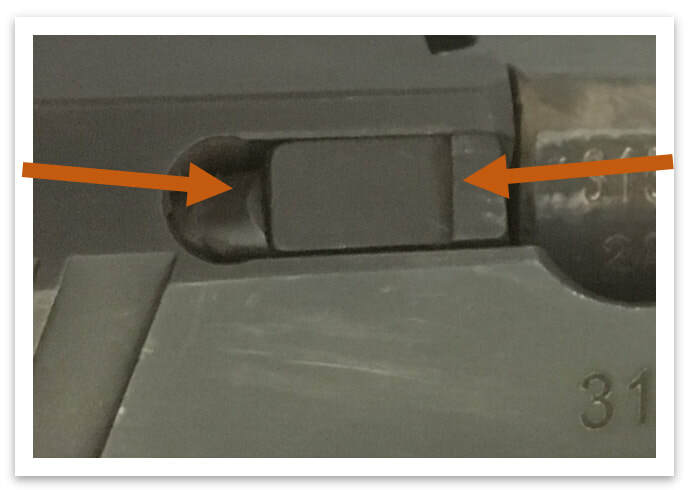 A stuck trigger blade is a VERY unsafe condition, since the trigger blade staying locked to the rear typically disables a gun’s other safeties (like firing pin blocks and drop safeties). This is less a commentary on the Steyrs and more a commentary on trigger blade safeties in general. Like grip safeties and manual safeties, trigger blade safeties have their pros and cons, but their wide, flat surfaces and relatively weak return springs make them the most susceptible of all the safety types to dirt and debris - there is a reason not every gun uses them. Steyr is a rarified marque and it should come as no surprise that their pistols are superb – a great trigger, soft recoil, and superb reliability are all you can ask for in a pistol. However, Steyr pistols are also extremely unique, both in their appearance and sighting system, and the American gun market is slow to accept change. Stack that with a semi-premium price point, and it can be a tough sell. That’s a real shame, though, because most of your concerns about the Steyr will evaporate the first time you put a full magazine through one. They’re good pistols with uniquely low recoil, and you should try one out.